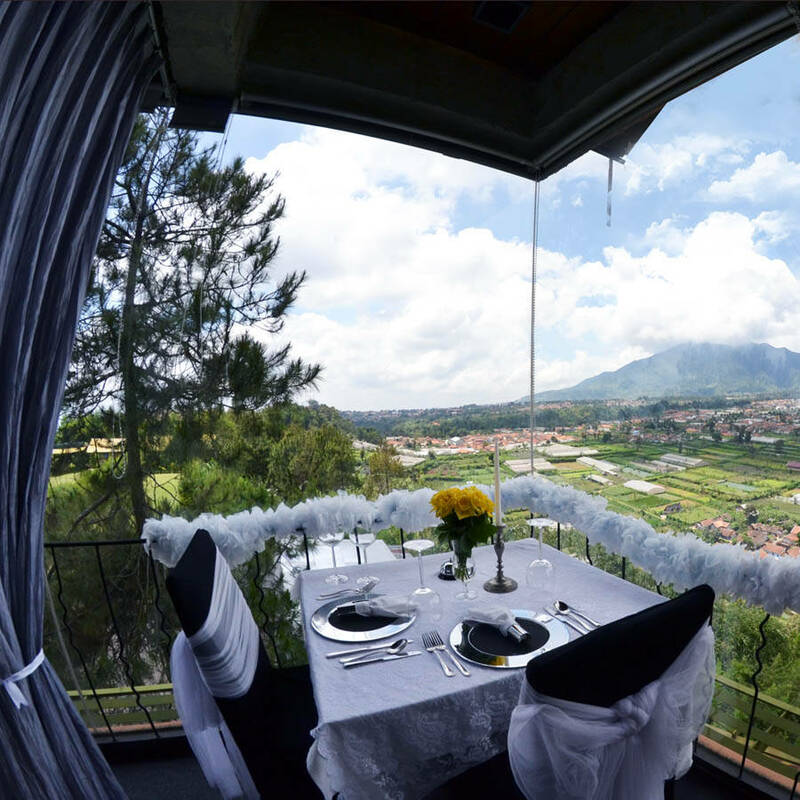 A trip to Bandung wouldn’t be complete without going on a culinary tour all around the city, and what can possibly be better than dining at an amazing restaurant with gorgeous views? 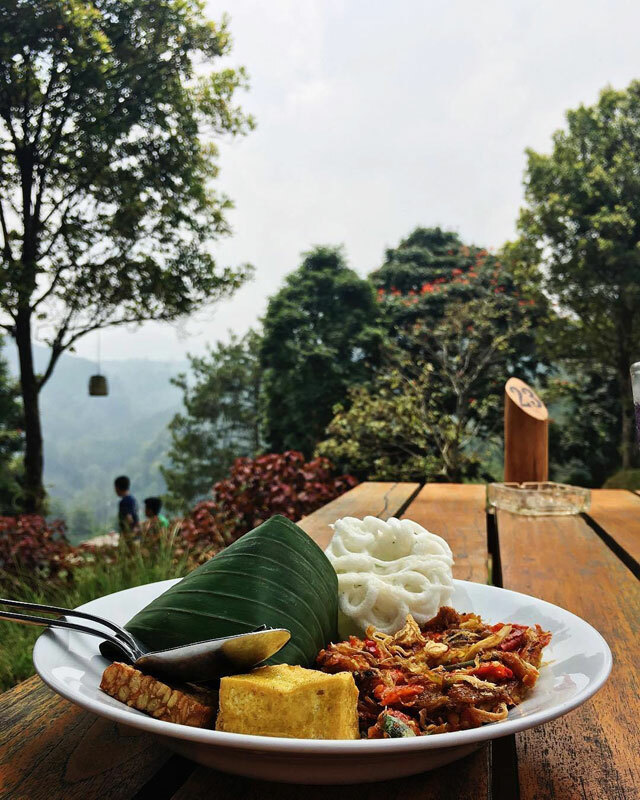 You have seen how spectacular the views are from Bali’s restaurants, and Bandung is no less than second best – with rolling hills, city lights, lakes and even paddy fields. 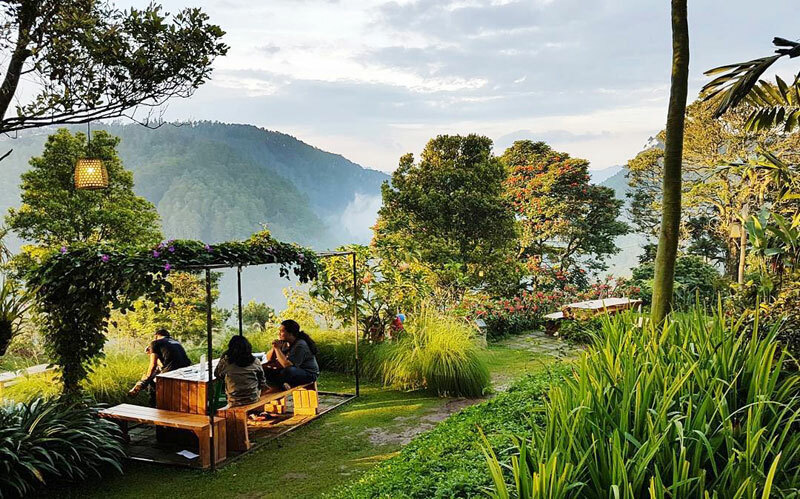 So here’s 14 top restaurants with the best views in and around Bandung (and Lembang) for all you foodie-lovers out there. 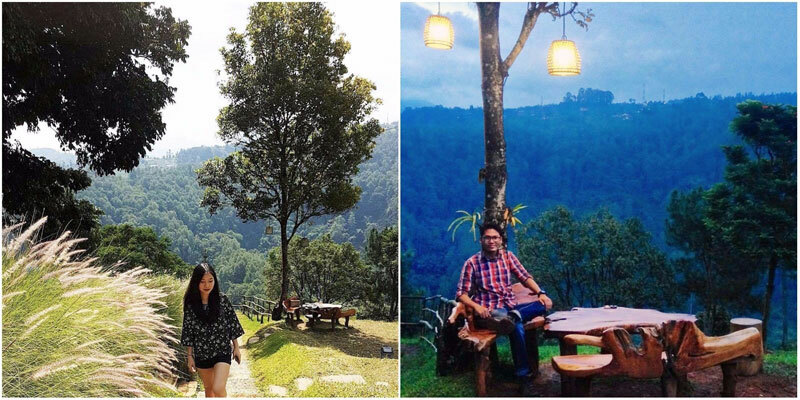 The Valley Cafe is one of the most famous cafes in Bandung, hugely popular among tourists. 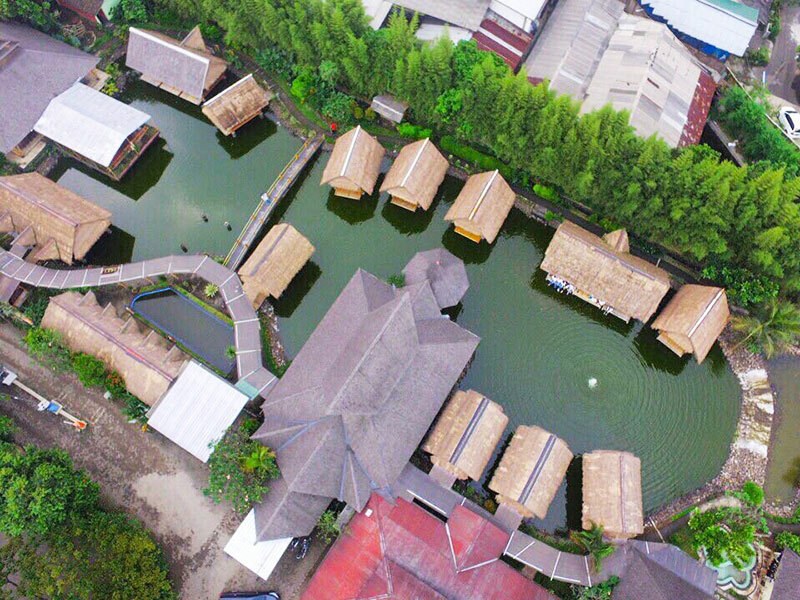 The restaurant itself is part of a resort. 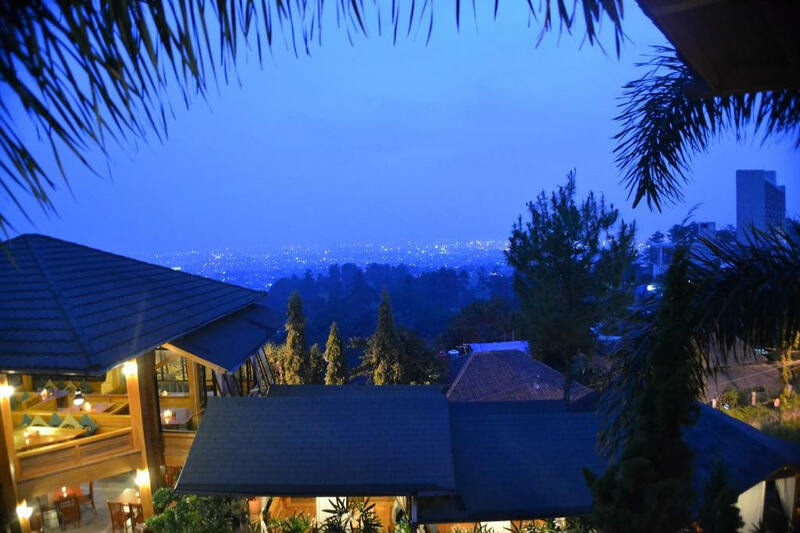 Located in the upper hills of Dago, you’ll be able to enjoy the serene and beautiful city of Bandung, regardless of the time of the day (or night). Do try its steaks, which costs around USD $46.75. 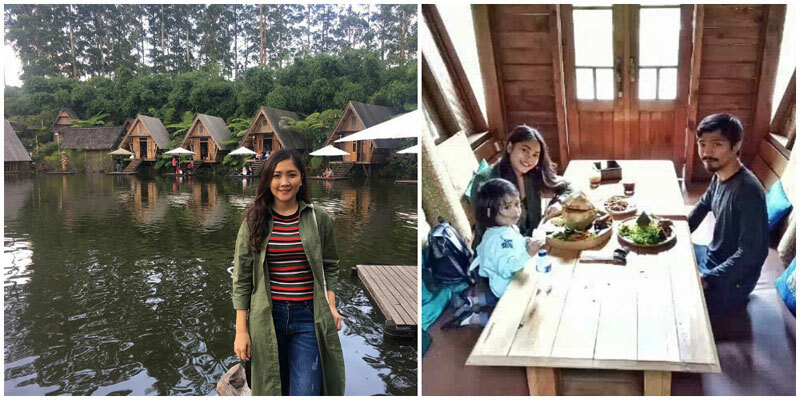 Ever heard of Legok Kondang’s Pinisi Resto? 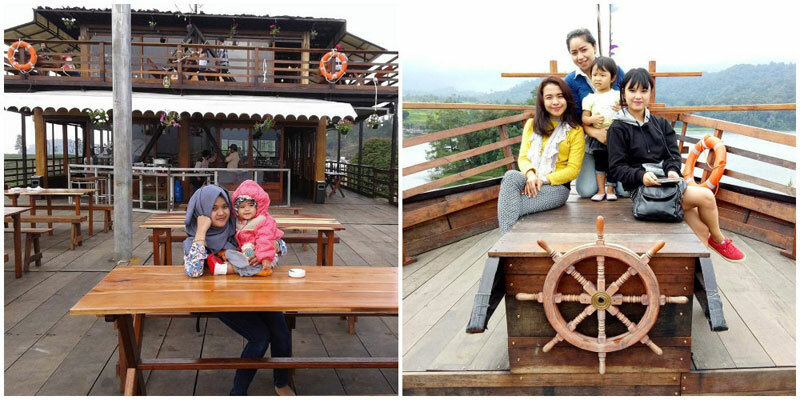 A new discovery we’ve found, the Pinisi Resto is on a giant ship docked beside the lake and surrounded with gorgeous mountain views. The kids will be ecstatic to climb aboard the ship and have one of the most unforgettable dining experiences ever. 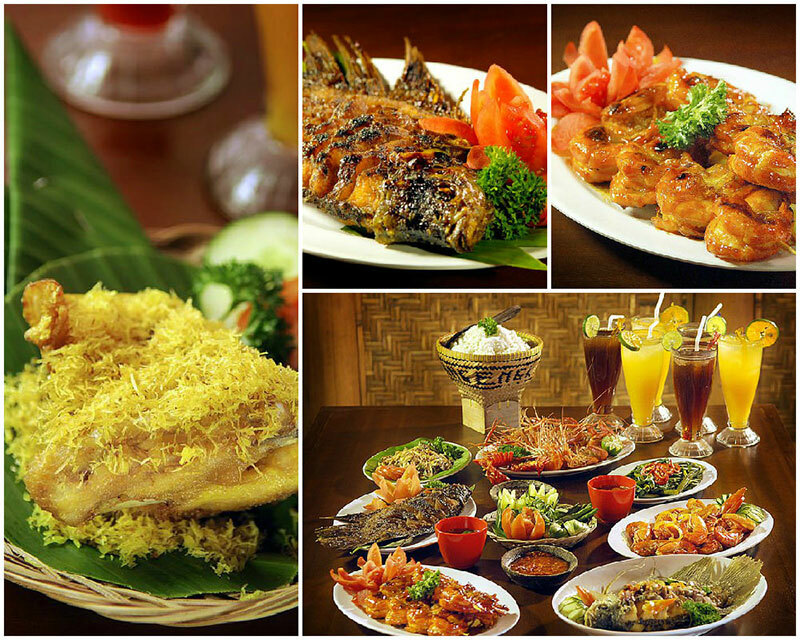 Serving up a BBQ feast, Pinisi Resto is a great place to bond with the family while feasting and play acting as pirates! 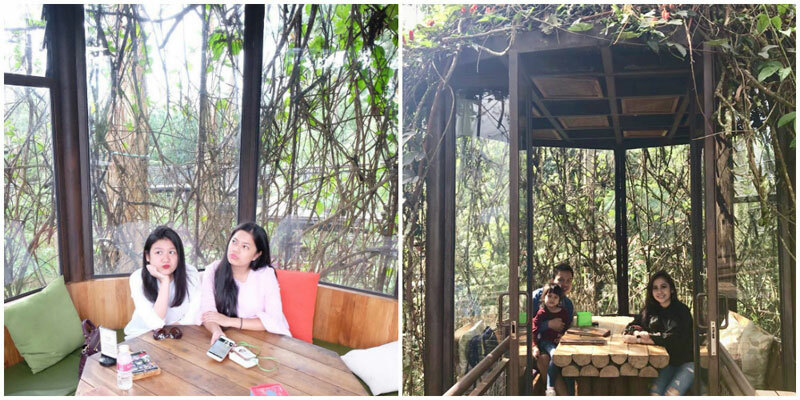 PS: Pinisi Resto is located in family glamping site Legok Kondang, do call ahead to make a reservation if you’d like to dine here! 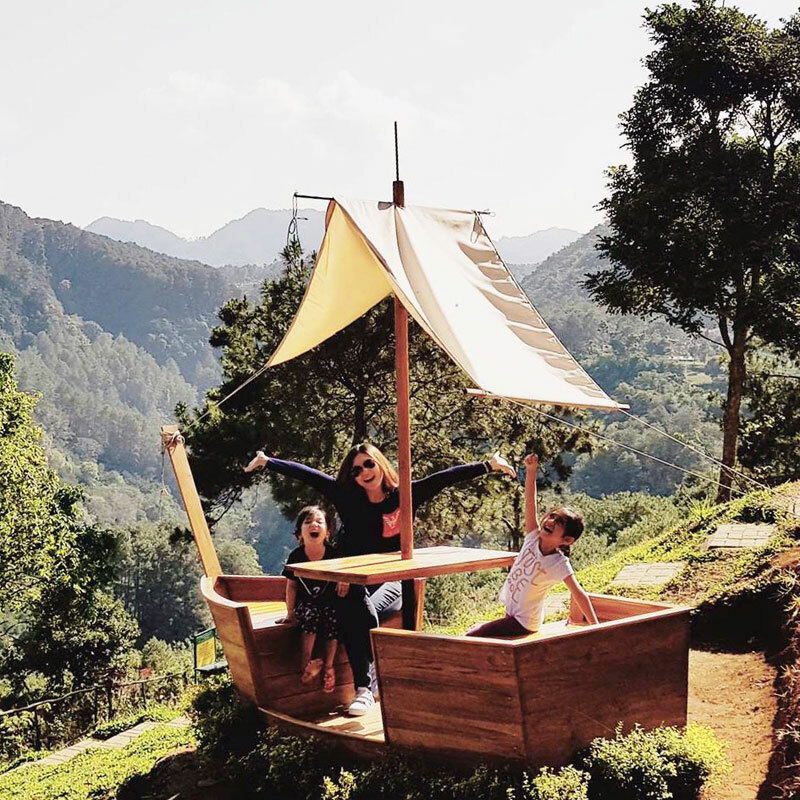 For parents looking for a kid-friendly place to dine at with stunning panoramic views of Bandung, fresh mountain air, and great coffee – head to Lereng Anteng. 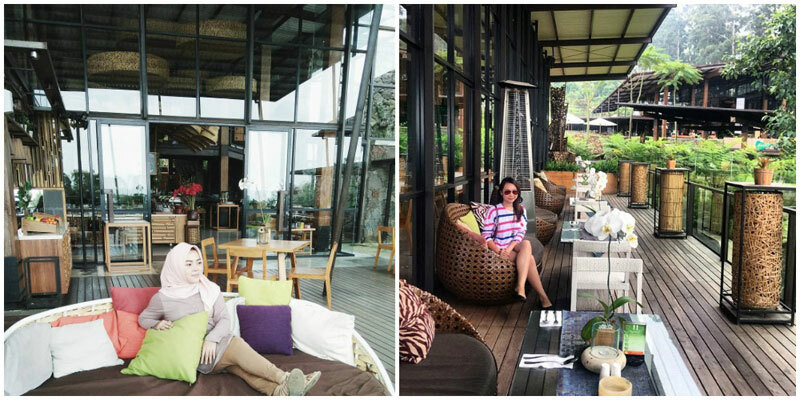 Get seated in colourful beanbag chairs, and enjoy the refreshingly cool weather and misty mountain views. 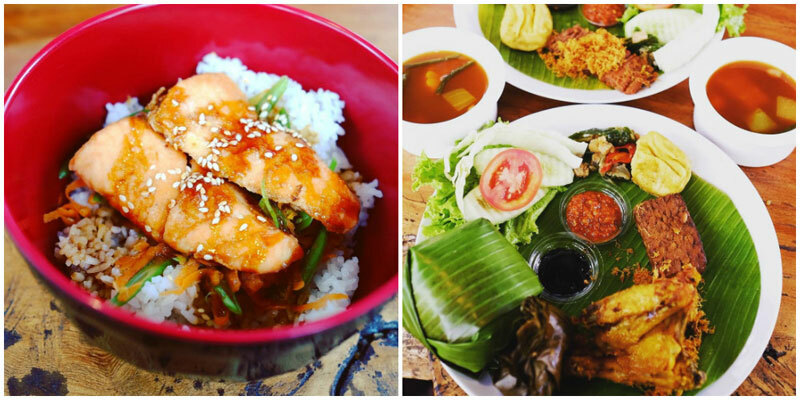 Up on the menu, choose from local favourites ranging from Indonesian to Sundanese fare. 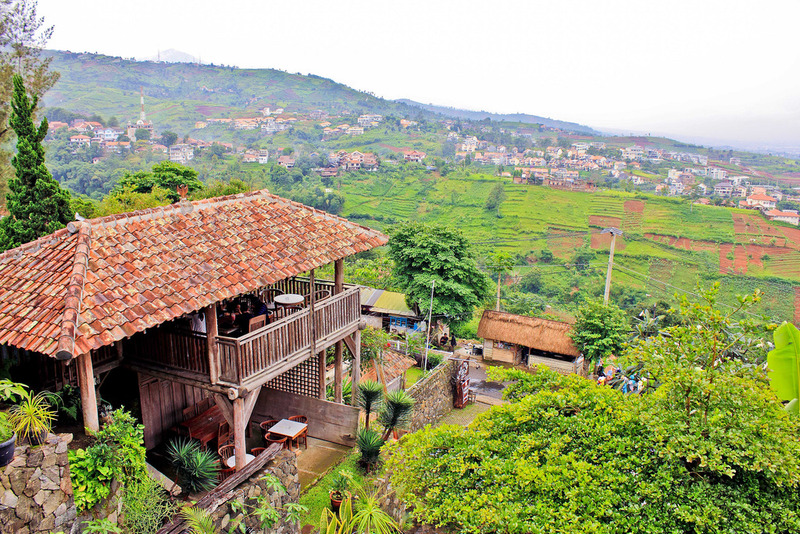 As for coffee, you might be happy to hear that Vietnamese Drip coffee is available here too! 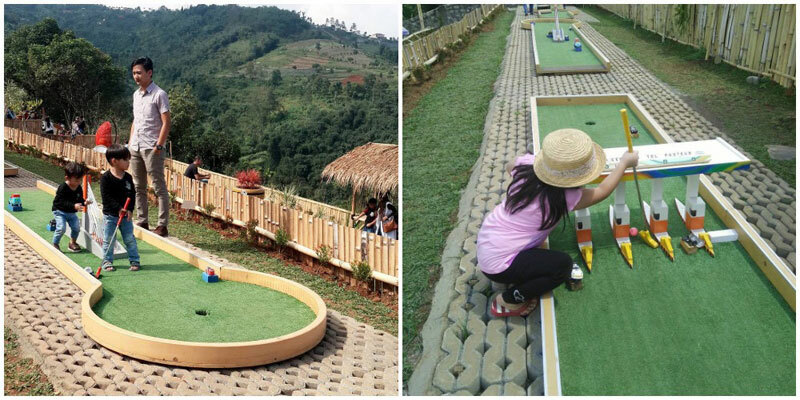 Apart from the views, the fun and cosy beanbags and the food, remember to bring along a board game or two for a fun family treat! 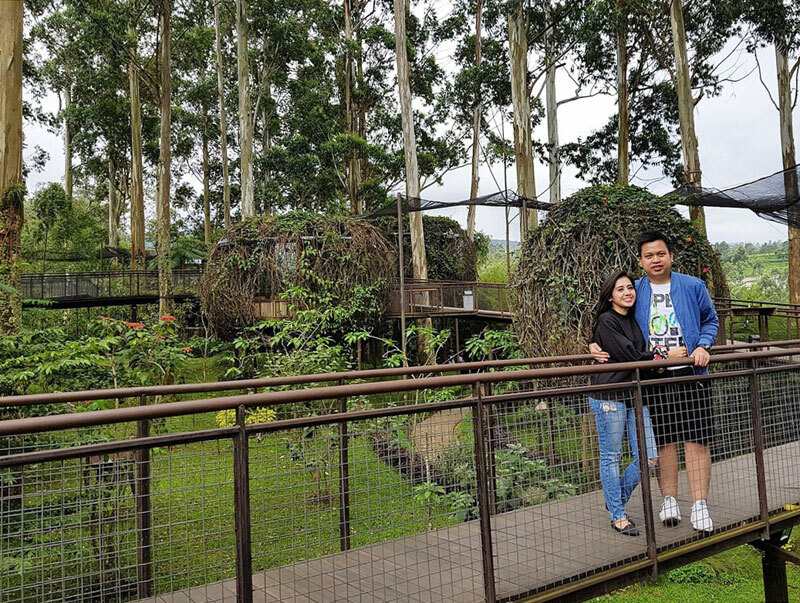 Dusun Bambu Family Leisure Park is an ideal place to spend the weekend with your loved ones, family or friends – here, you can find everything (literally), from villa accommodations to camps to activities like biking or adventure games for kids. 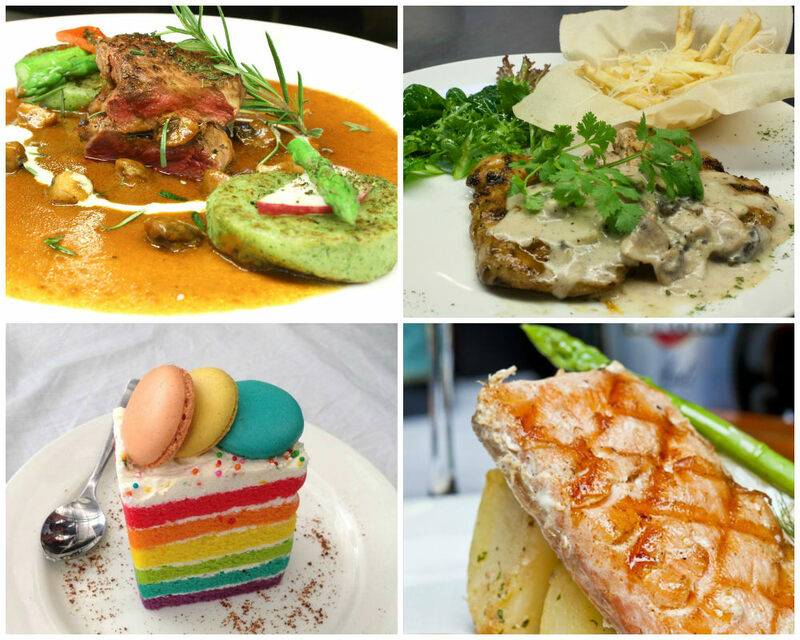 And of course, how can we miss out the best places for lunch or dinner? 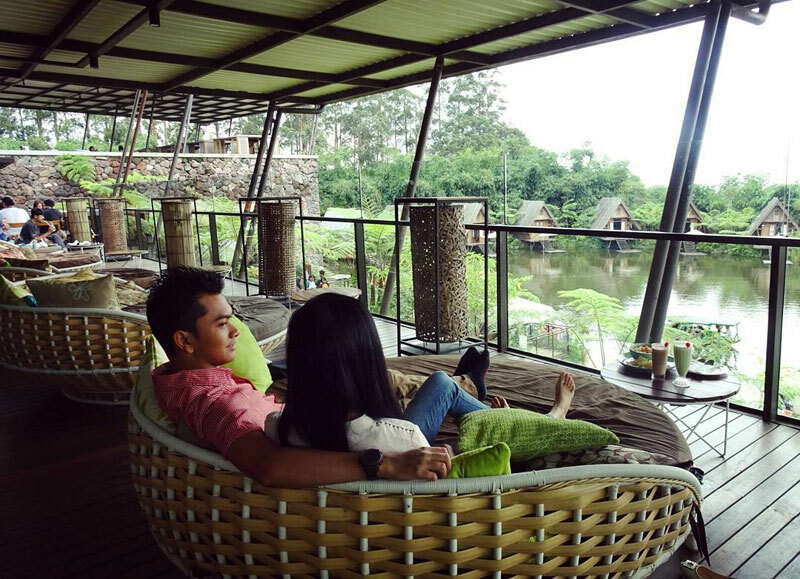 Dusun Bambu does not only have one, but three amazing restaurants, each with a unique theme, where you can dig in and bask in the gorgeous views. 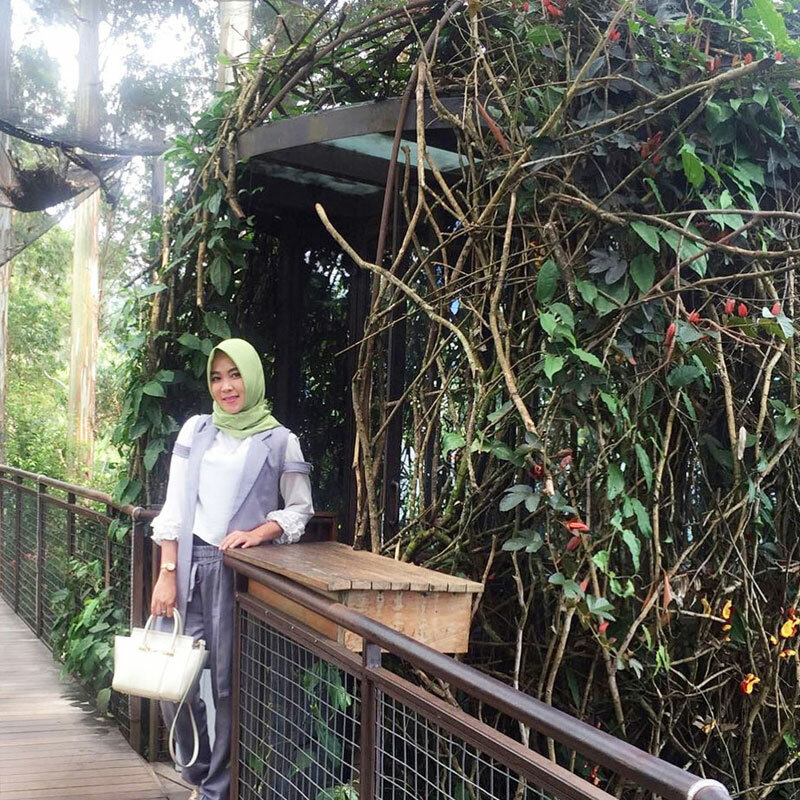 Imagine dining like a bird, high up in the trees. 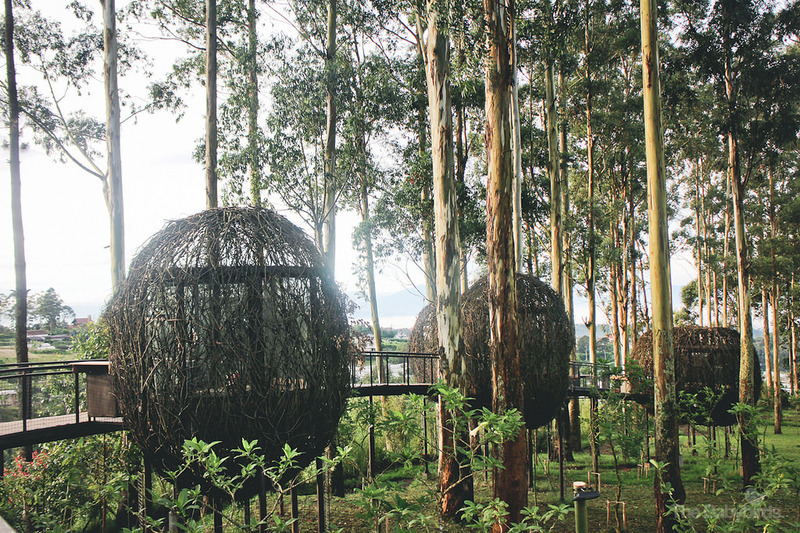 Each of its seats has a design of a bird’s cage that sits on top of the tree. 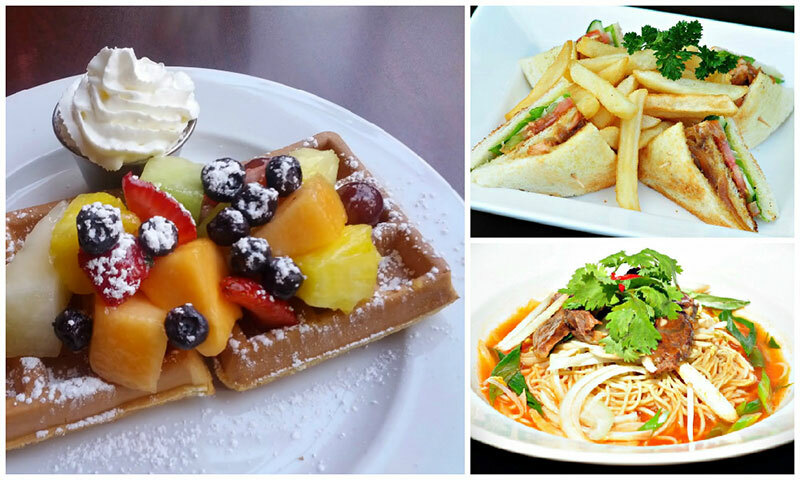 You can enjoy nature’s greenery all around you as you dig into your meal. What should you try? 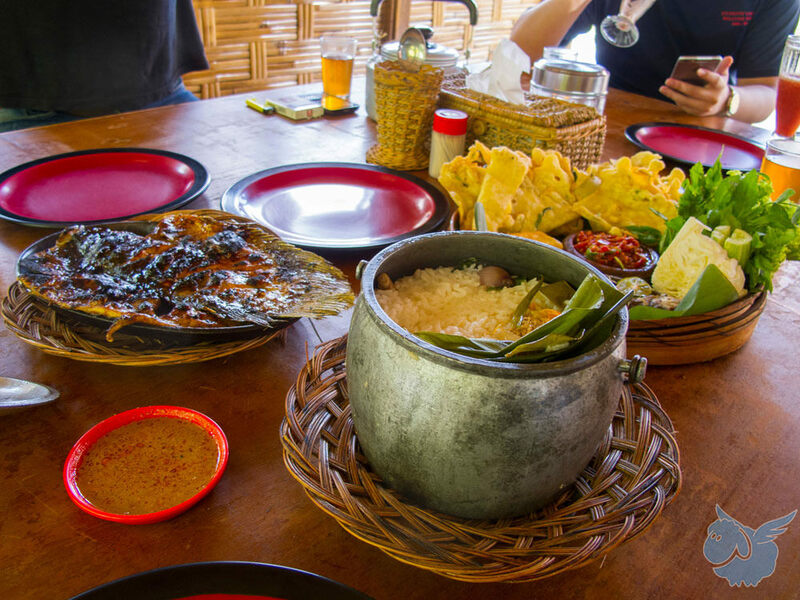 One of its popular dishes is the coconut roasted rice! 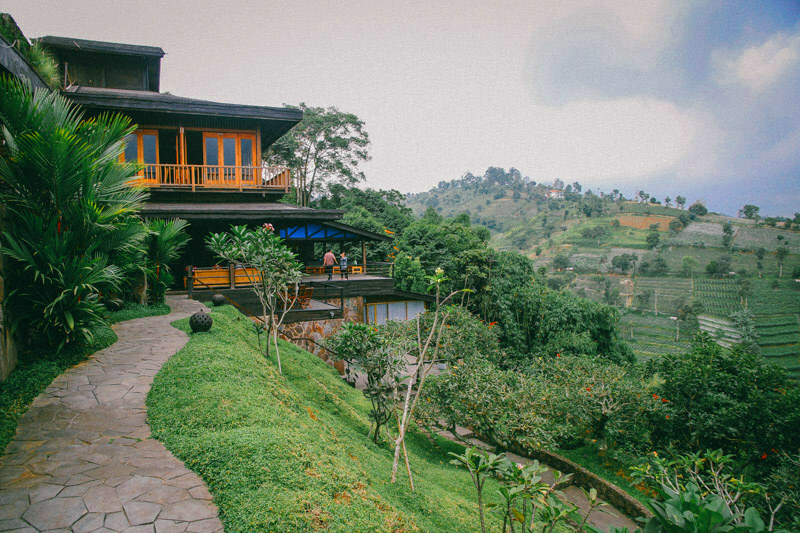 This is one of the dreamiest places to dine at in Bandung. 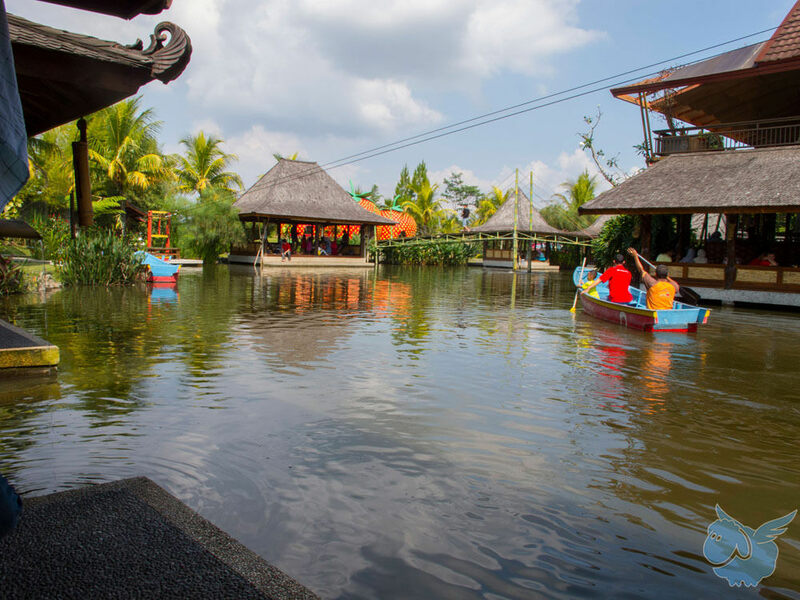 The Purbasari restaurant features a traditional Indonesian gazebo that surrounds and overlooks a lake. 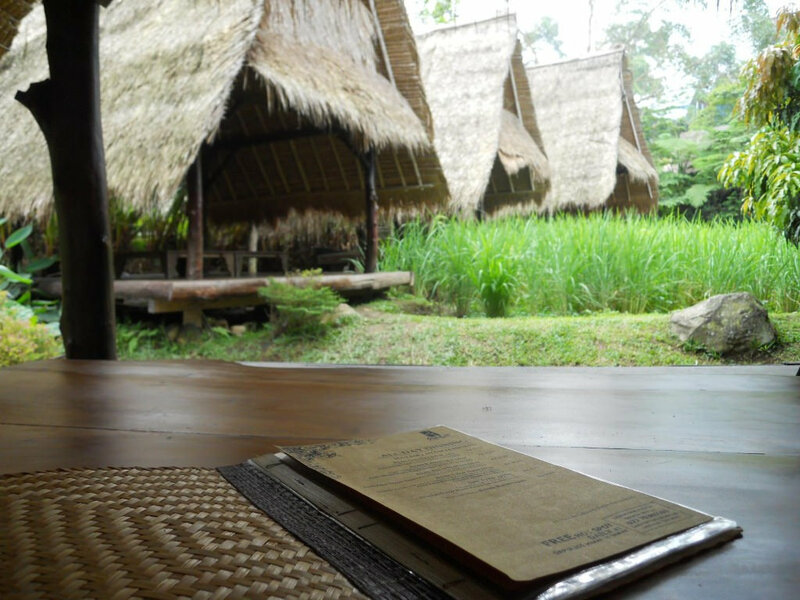 Here, you can dine in a traditional Indonesian vibe, and in comfort and style. 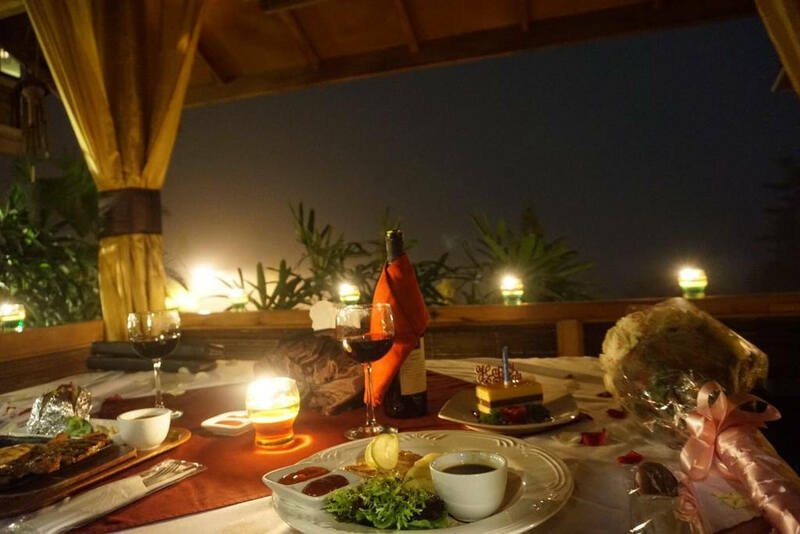 Trust us, if you bring your significant other here, he/she will be impressed! 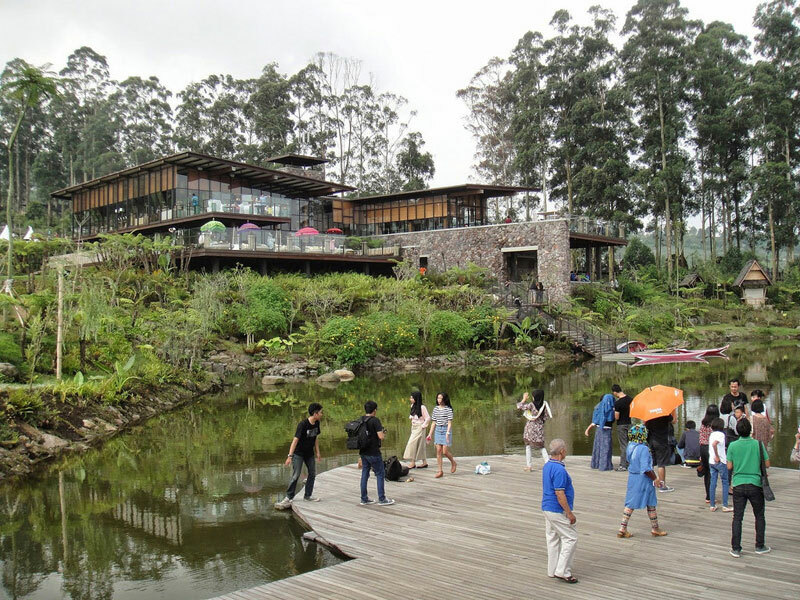 Burangrang is is the biggest cafe at Dusun Bambu. 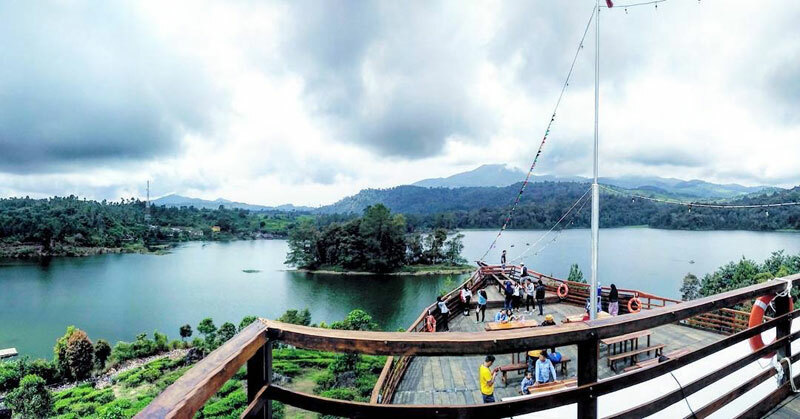 It’s located among the taller hills at the resort, which gives the customers a clear view of the Burangrang mountain (hence the name!). 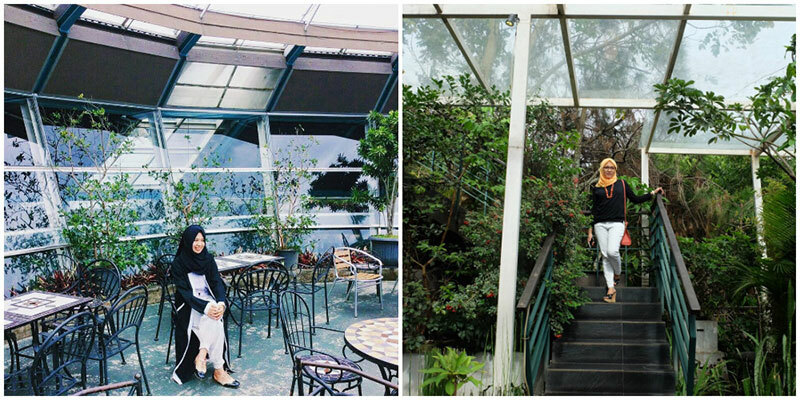 With its glass walls, you will be able to enjoy panoramic views of the cafe’s surroundings. Don’t leave without trying one of its specials – the betutu grilled chicken. 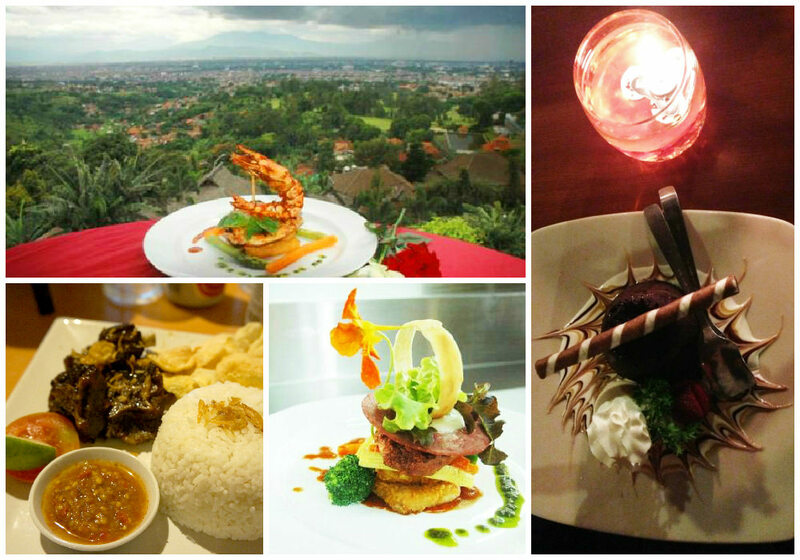 Enjoying homemade favourites with scenic mountain view? Sounds like the perfect combination! 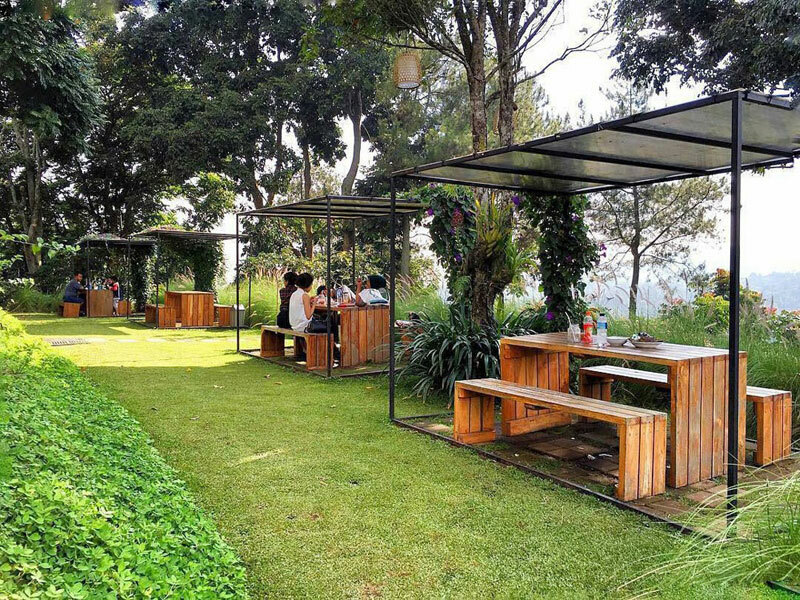 Located in the Dago highlands, this cafe is hugely popular among young people and families who love to chill with Bandung’s panoramic tall mountains and cloud-speckled blue sky. 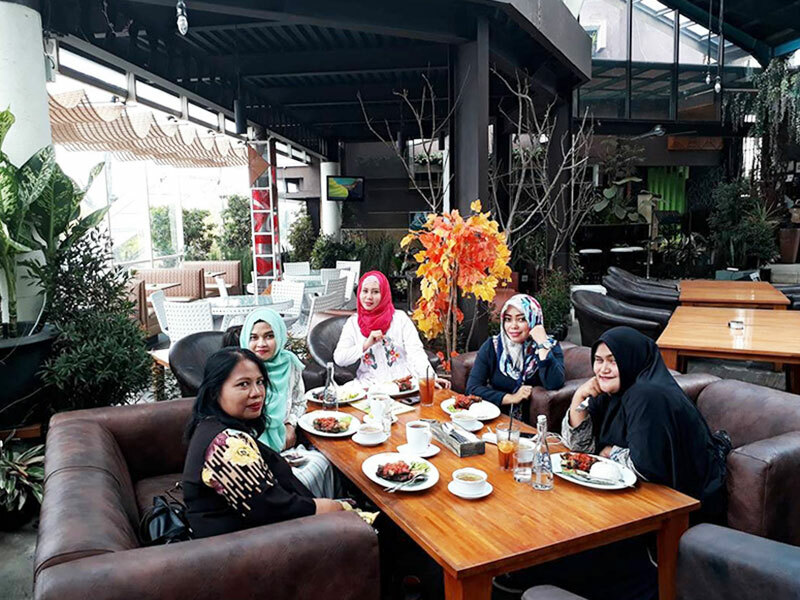 Cafe D’Pakar is a humble cafe serving light bites such as sandwiches and martabak (sweet stuffed pancakes), and heavier meals such as rice and noodles. 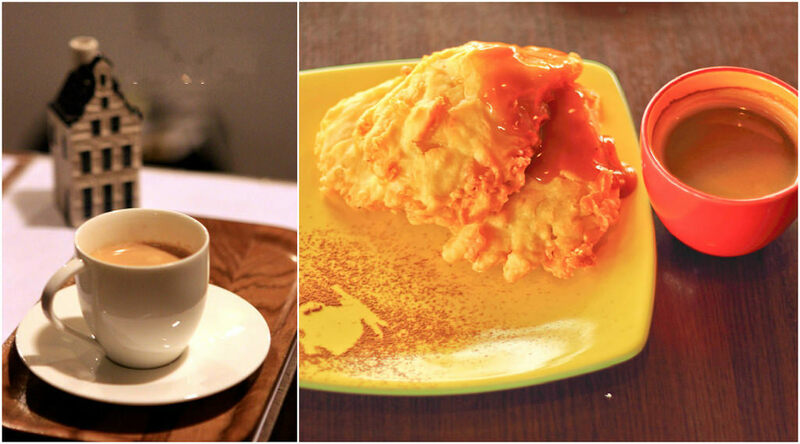 As the cool breeze accompanies your sweet meal, you’ll appreciate a warm cup of coffee that completes your relaxing experience. Getting to Cafe D’Pakar requires a bit of an effort as it is outside the city centre, but you just need to visit once to understand why it’s worth the trip! Opening Hours : 11pm – 6pm (Tues – Fri) and 9am-6pm (Sat & Sun). Closed on Mondays. 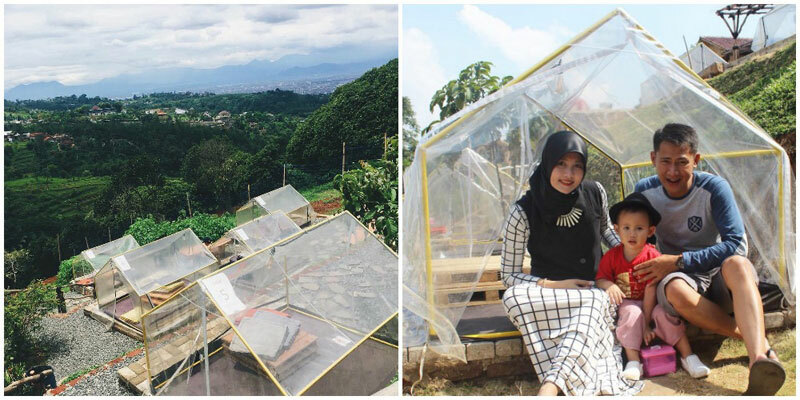 Minimum order of Rp 25,000 applies (USD 1.90). 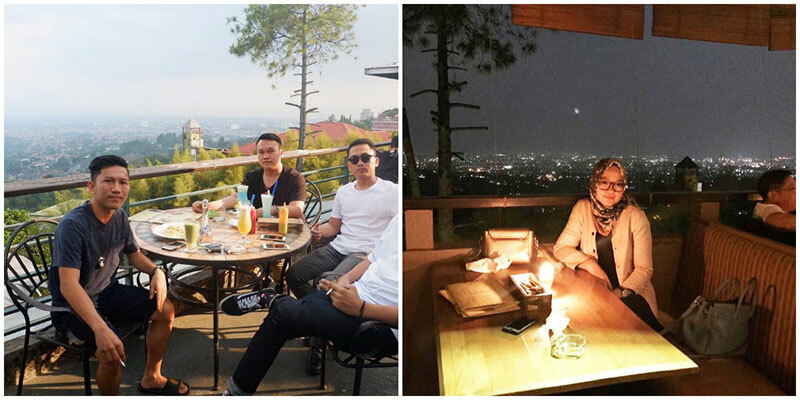 Previously known as Cloud 9, Rumah Miring Bar is acclaimed as one of the best bars at Dago Hill, where you can enjoy your food and drinks while overlooking the famous Bandung city view. 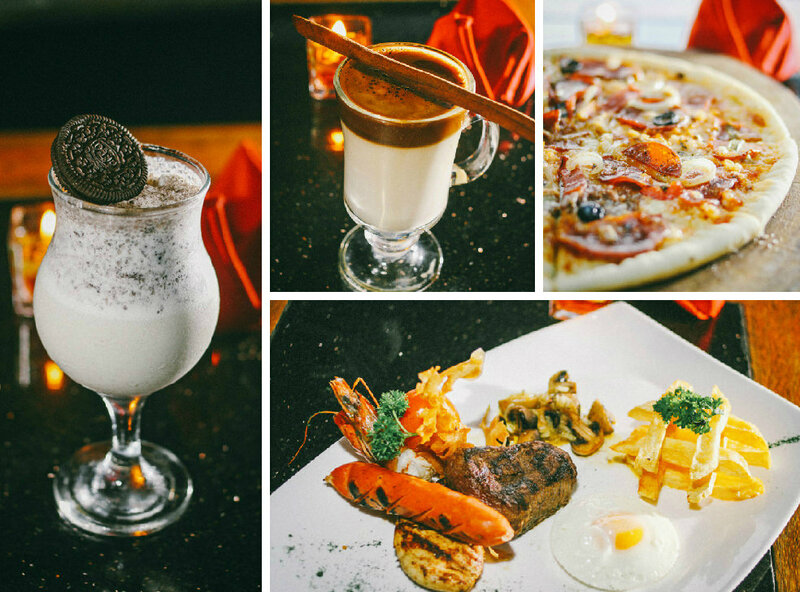 There is a variety of mouth-watering food you should try – from the mighty mixed grill, pizza with meat lover supreme toppings, and vanilla double chocolate to a classic hot chocolate with cinammon stick! 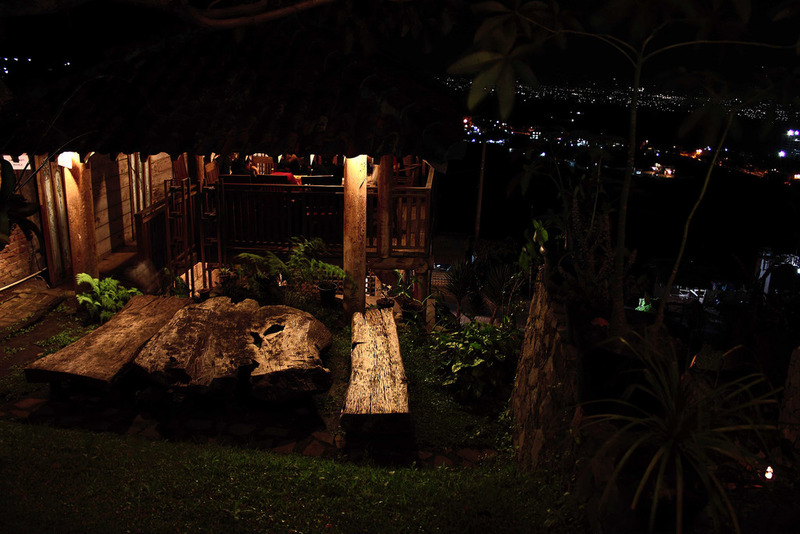 Every table is unique, but you will get the best view at the L bench at every corner of this restaurant. 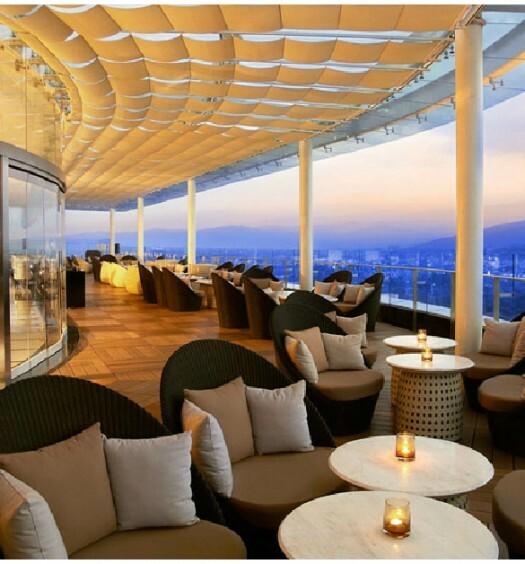 To top it all off, you can choose from a wide array of cocktails at an affordable price (around USD $3.90). 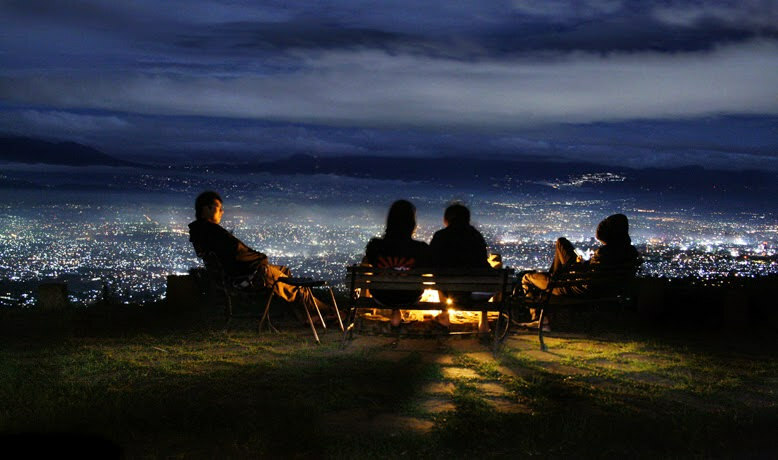 Nighttime at Bandung is simply beautiful, with all the pretty lights lighting up the city. 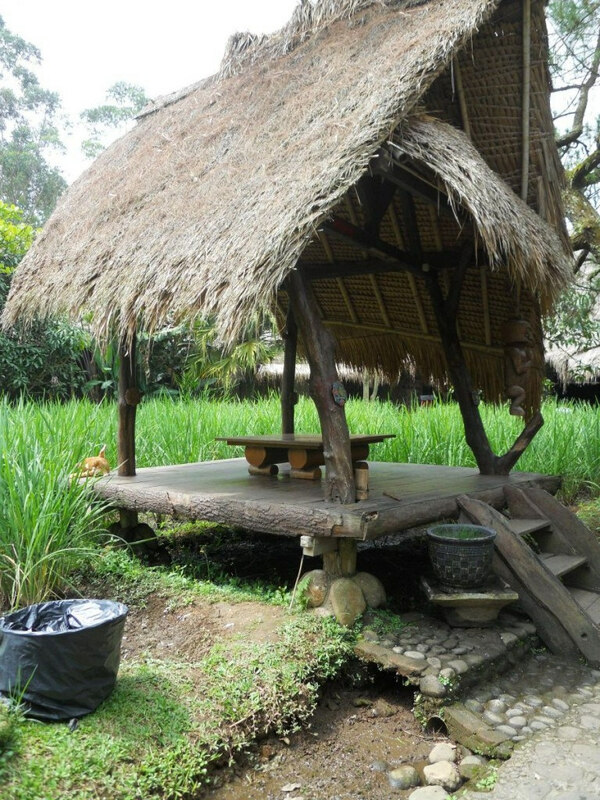 For larger groups, you can have the whole hut to yourself for maximum privacy. 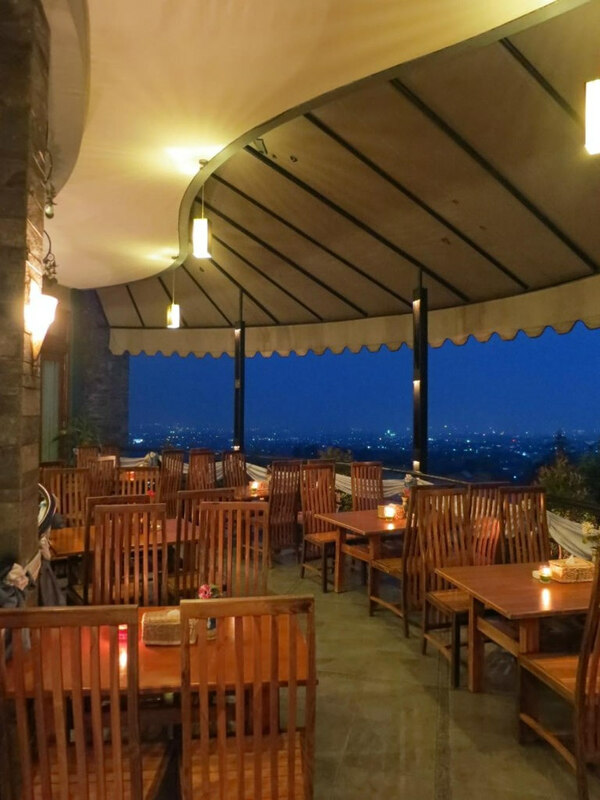 At Stone Cafe, located up in the hills, you will want to enjoy the city’s night view forever! 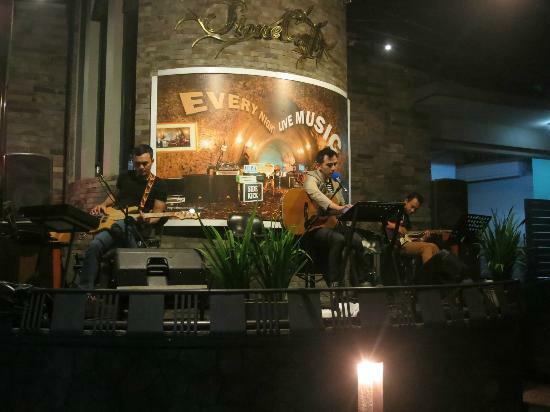 There’s live music every night at Stone Cafe too! And yes, of course we can’t forget about the food. Our recommendation? 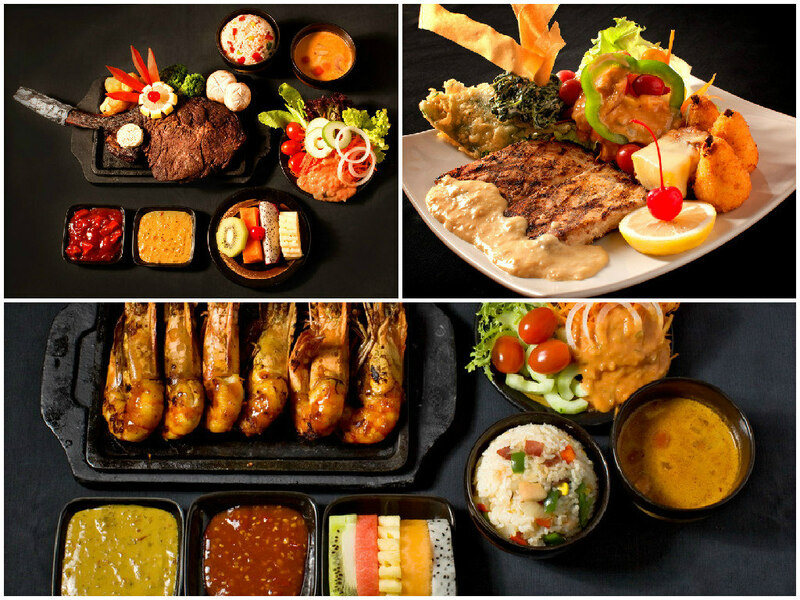 Try its most loved meal – the barbeque combo. 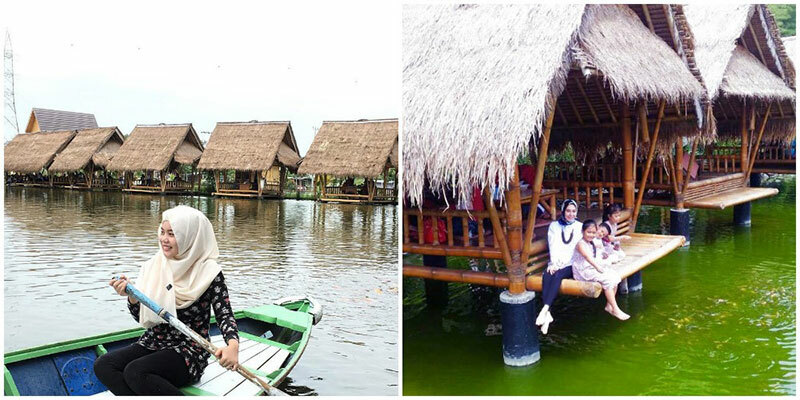 Imagine dining in a traditional Indonesian hut by the lake – the best place to retreat to after all the shopping in the city. 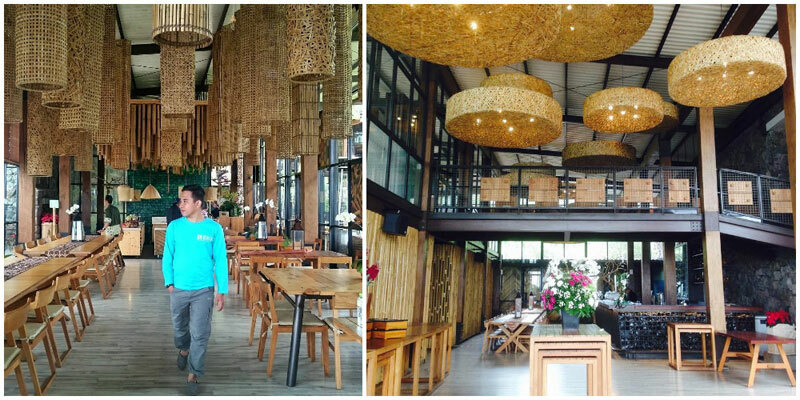 This restaurant has quite a few branches in Indonesia, including in Jakarta, but the one in Bandung is one of its best. 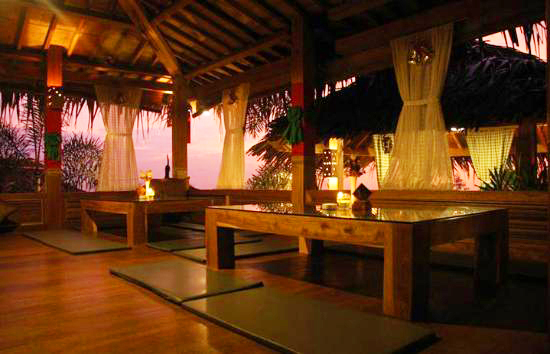 When you can tear yourself away from the gorgeous view, don’t forget to try one of its signatures – honey glazed prawns. 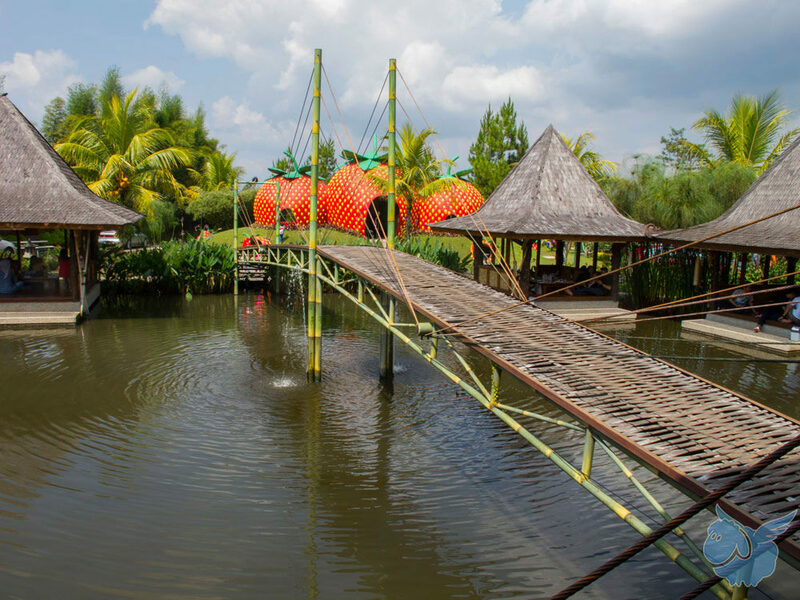 There’s also a fish pond and a children’s playground to keep the little ones entertained while you enjoy a long lunch. 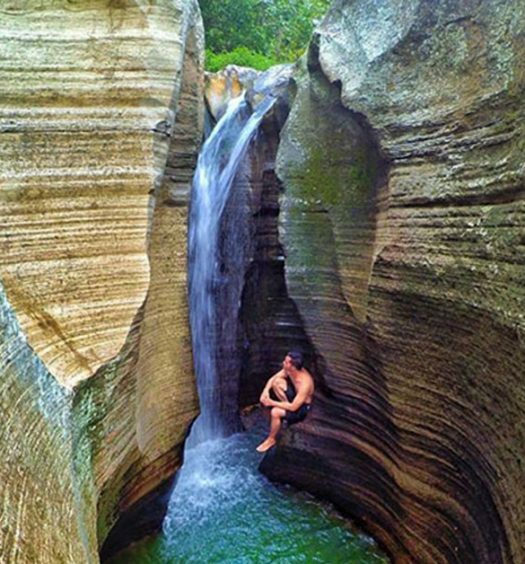 Not a lot of people may know of this hidden gem located at Bukit Moko (Moko Hill). 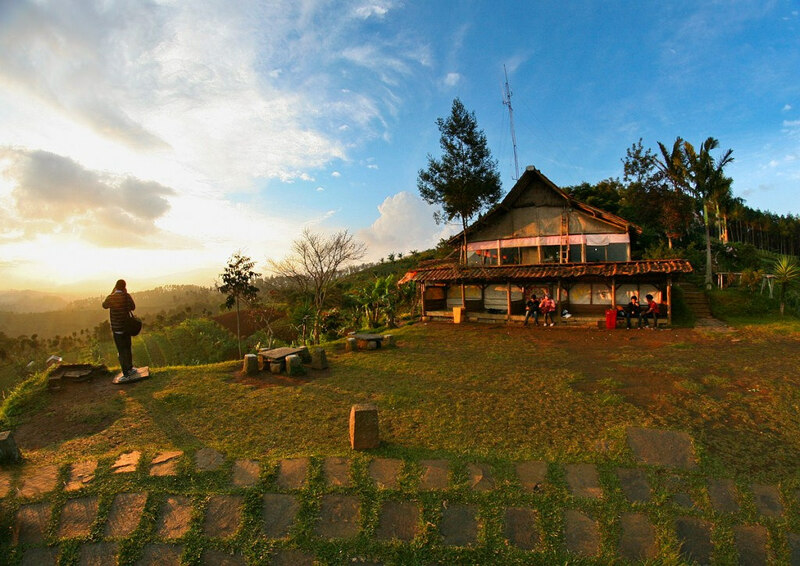 Warung Daweung has breathtaking views of greenery, and it’s one of the best places to catch the sunrise and sunset. 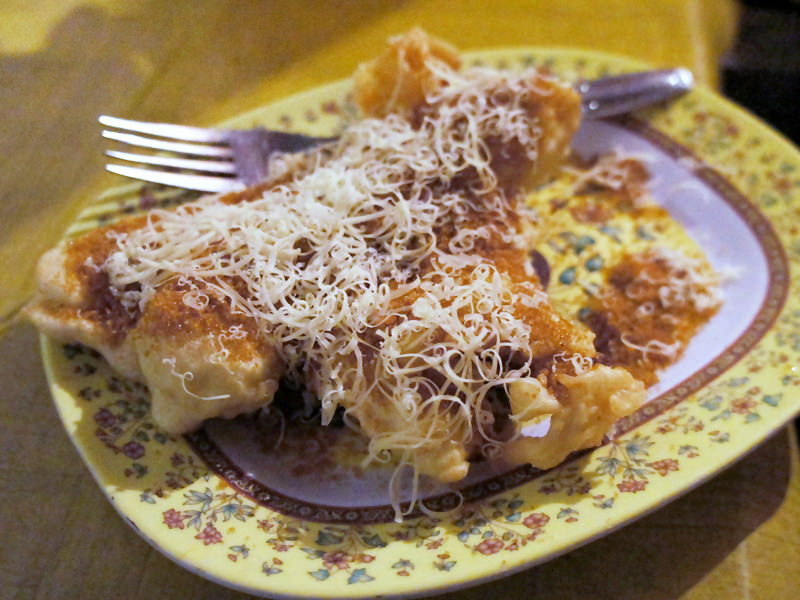 Their fried banana fritters with cheese is heavenly, at only around USD $1.15! 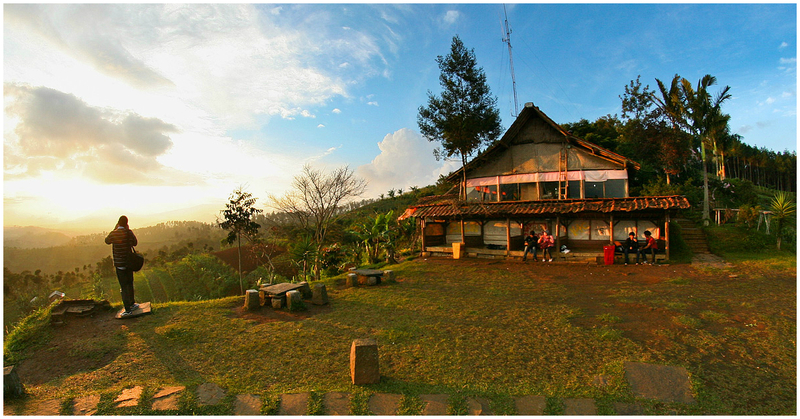 It is also the only restaurant located at Bukit Moko, so it’s popular with the locals. So don’t fret about getting lost! 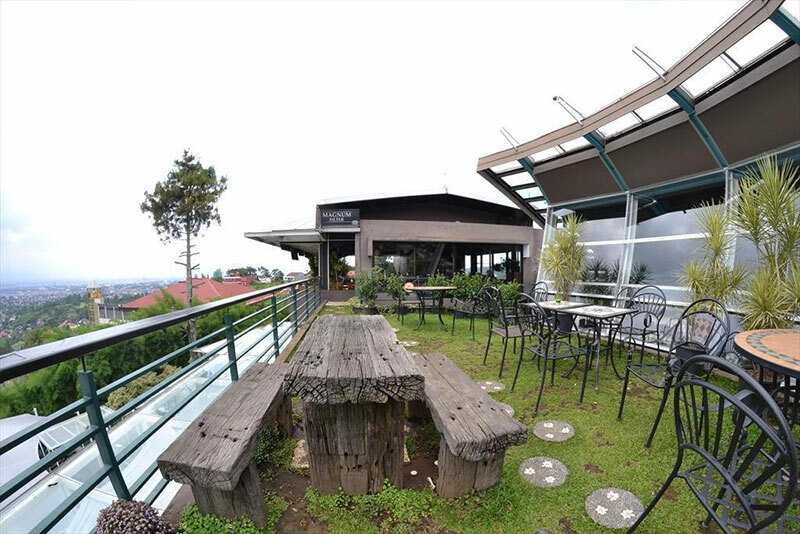 Cocorico Cafe has one of the best rooftop dining with views at Bandung. 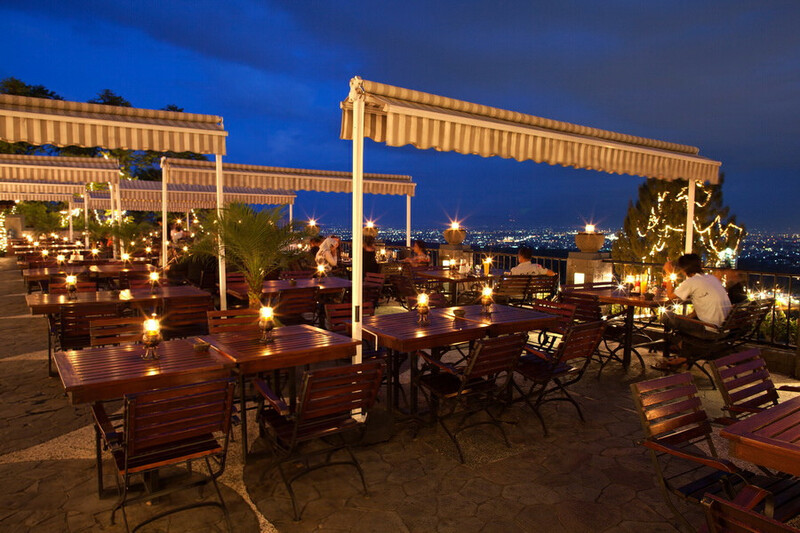 In fact, the rooftop dining area is designed to be a small garden! 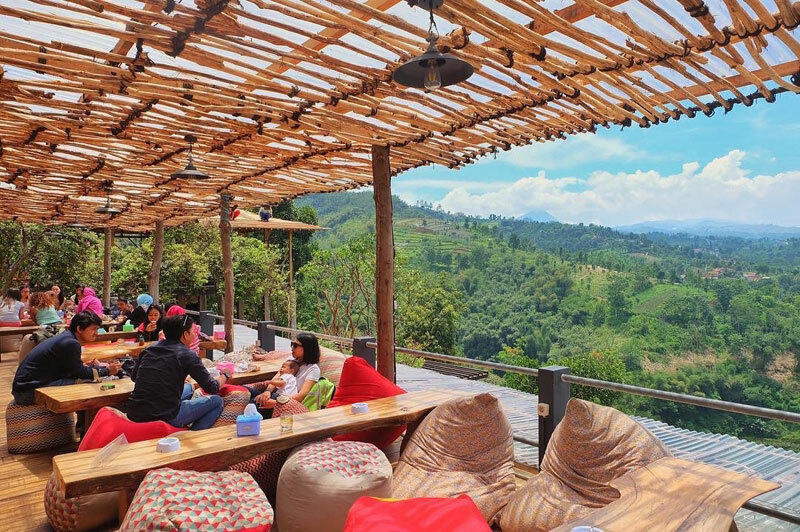 Located at Dago Hills, you can enjoy the amazing view of Bandung city while digging into its famous waffle (known as the Wafflelicious), which costs around USD $1.80. 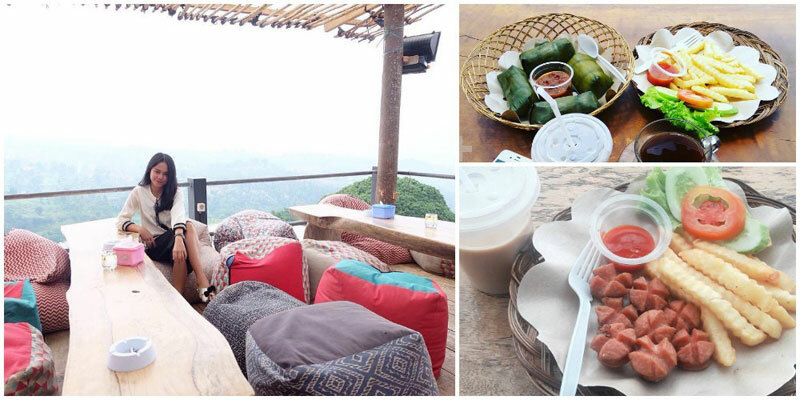 The Peak is another popular restaurant that travellers love to hang out at. Instead of concrete walls, the restaurant is encased in glass. 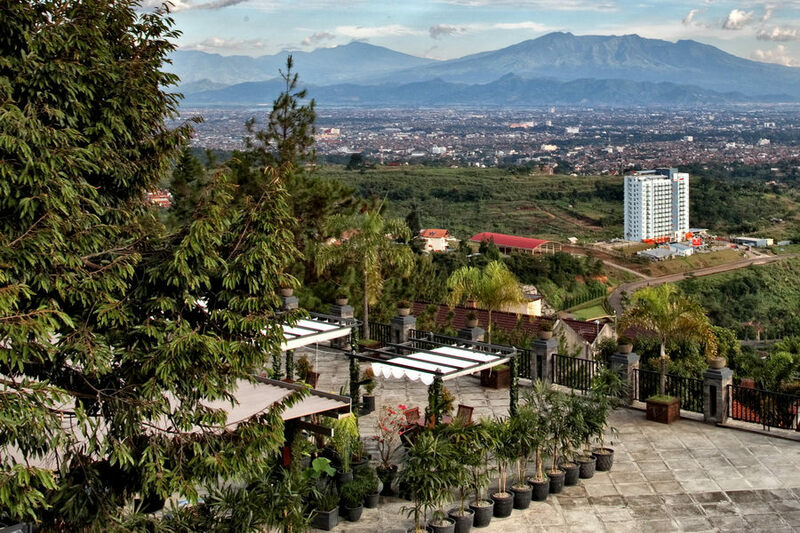 So you’ll be able to get a panoramic 360 degree view of Bandung! 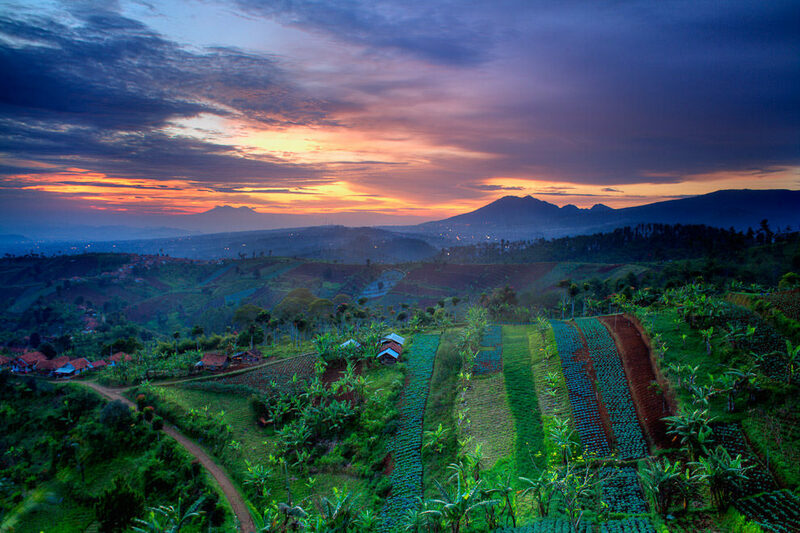 You don’t just see the city, but you can also lay your eyes on the famous Tangkuban Perahu mountain from the Peak. Its famous dish is the Kobe Steak, a premium beef steak that costs around USD $54. 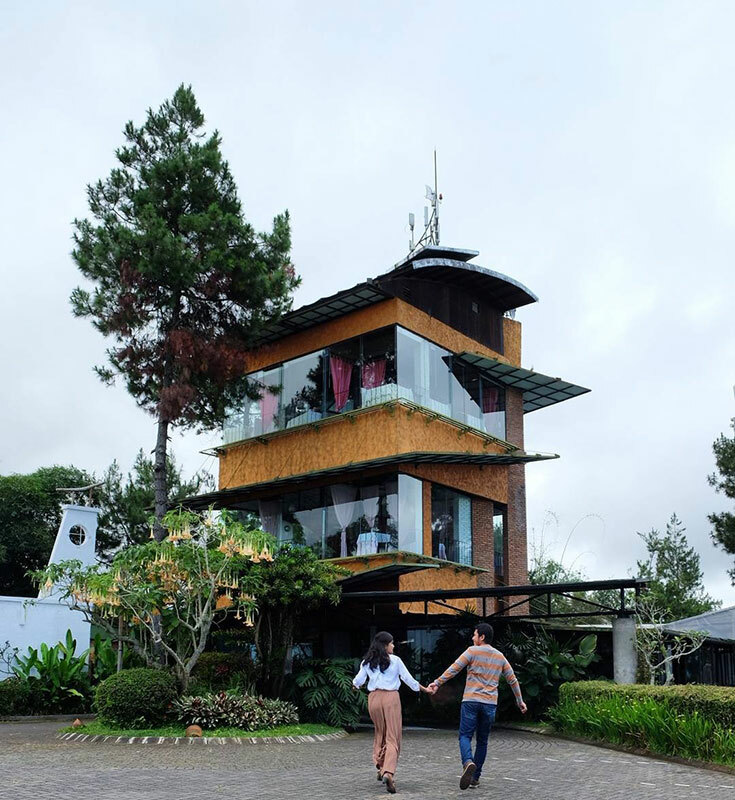 Kopi Ireng is one of the most popular coffee places in Bandung. 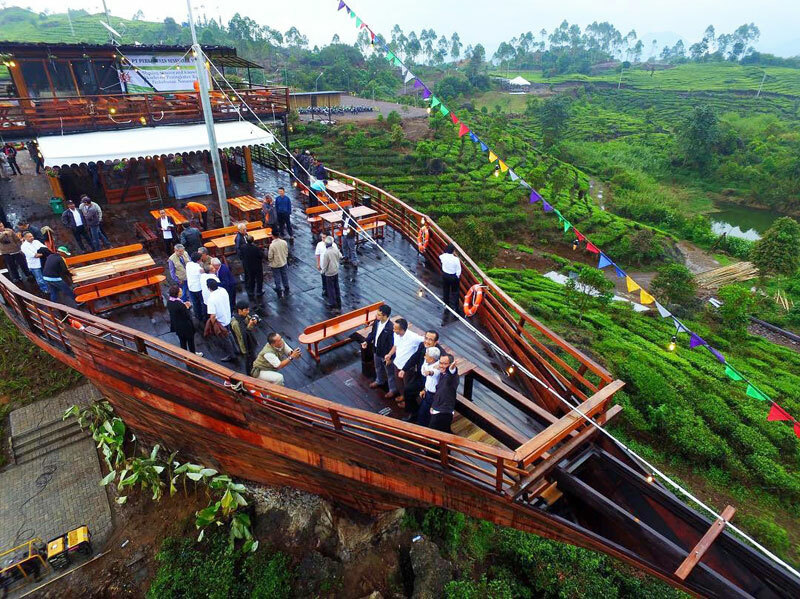 The cafe is constructed relatively high up, though it’s already located among the taller hills in Bandung. This way, as customers, you’ll be able to get a bird’s eye view of the city while sipping your warm coffee. 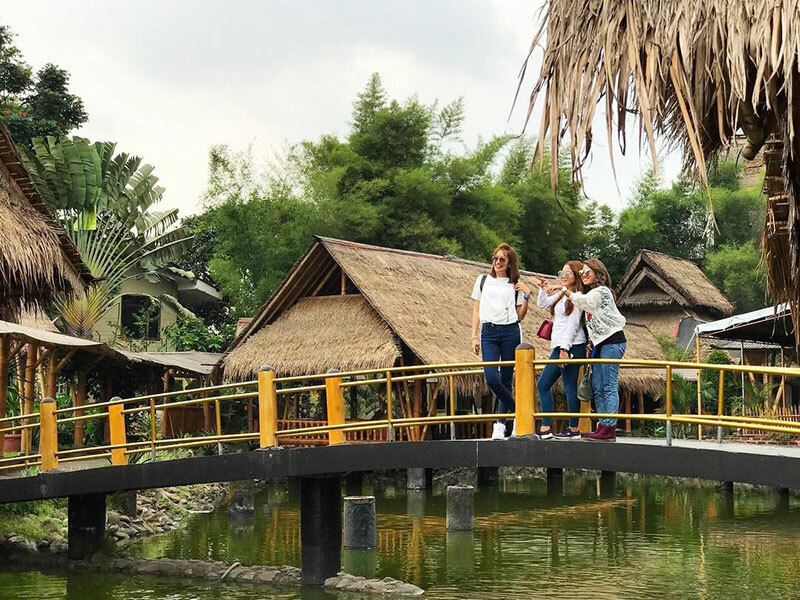 Surrounded by vast and lush paddy fields, at Sapu Lidi Sawah, you will truly be immersed in an authentic Indonesian experience. 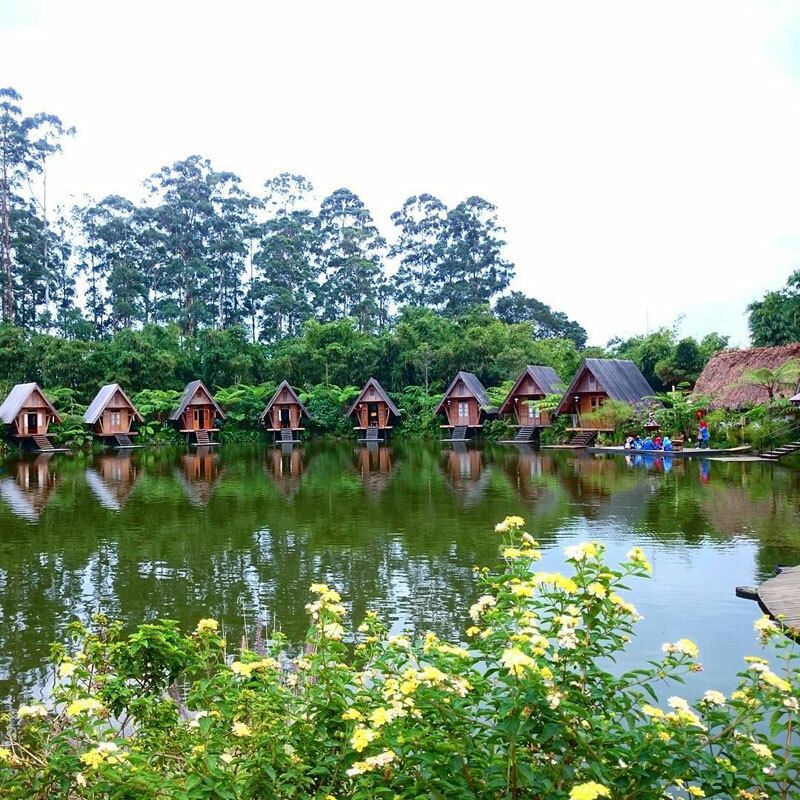 And if you stay in its resort, you can actually get to canoe in the lake, surrounded by traditional Indonesian huts – isn’t it such a beautiful and therapeutic experience? 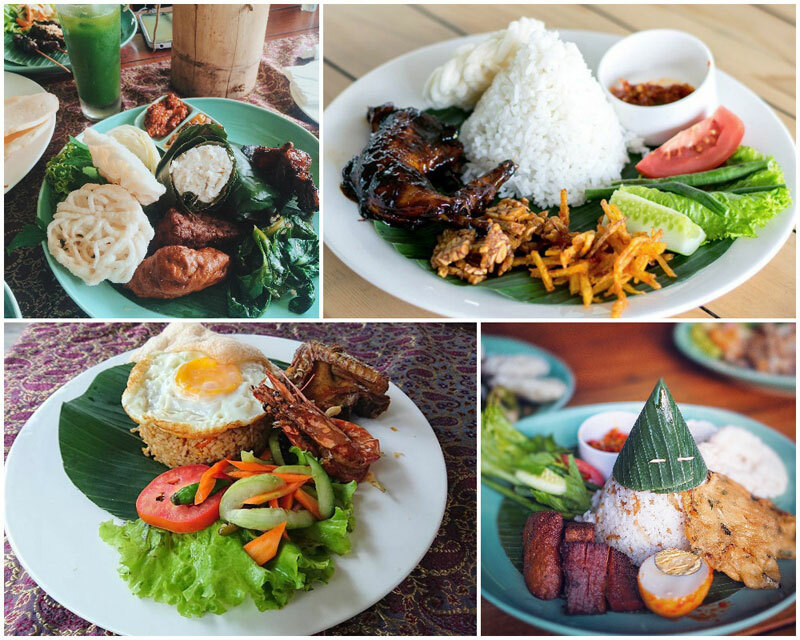 The restaurant is known for its traditional Sundanese food, which ranges from about USD $1.60 to USD $2.35. 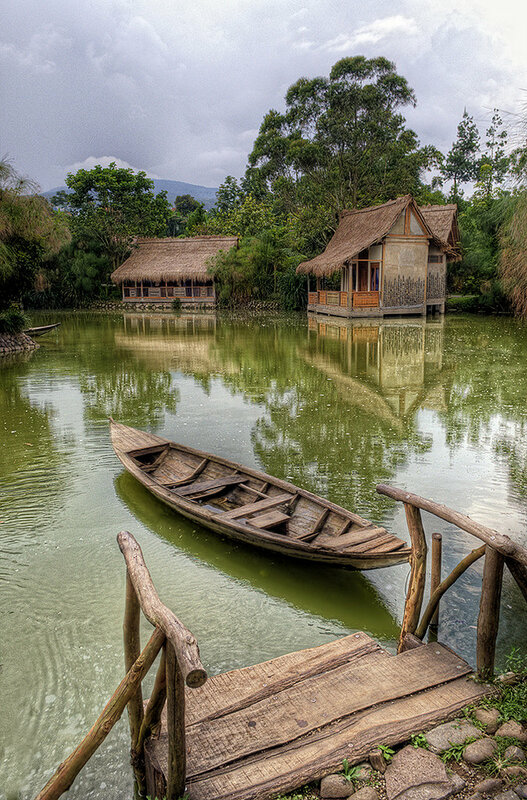 A few hours from the main city of Bandung lies this little paradise. 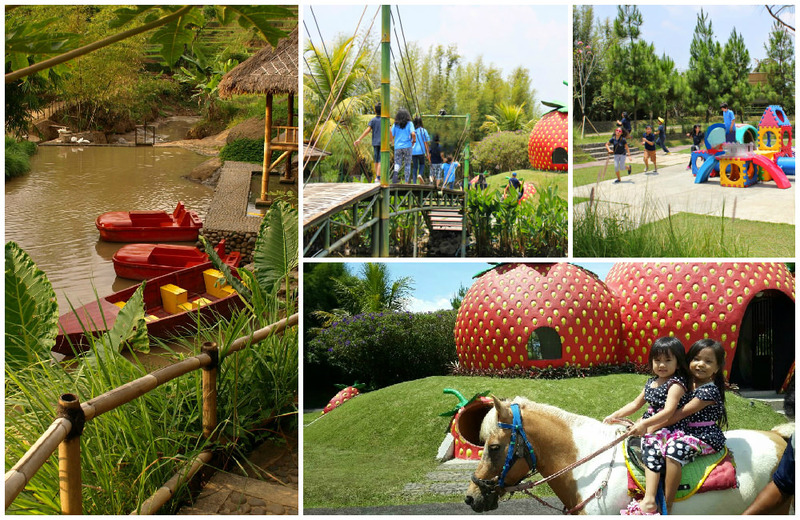 This is a playground for the whole family, where you can paddle in boats, play on the flying fox, ride on the ATV, bike around, ride horses, and of course, visit the house of strawberries (where the kids can play hide-and-seek!). 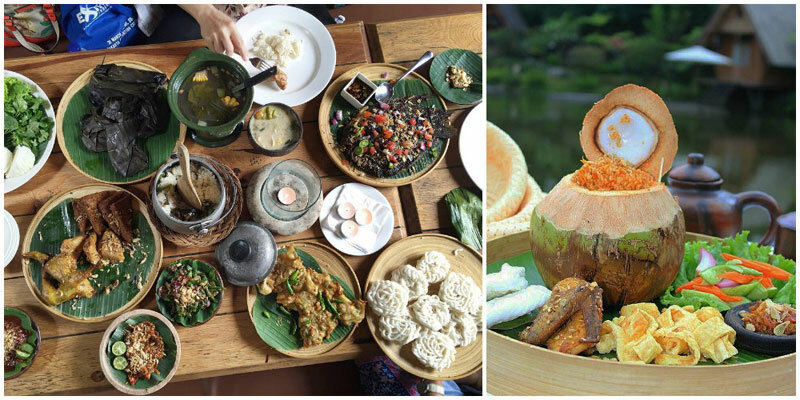 As for dining, you can enjoy traditional Sundanese cuisine here. 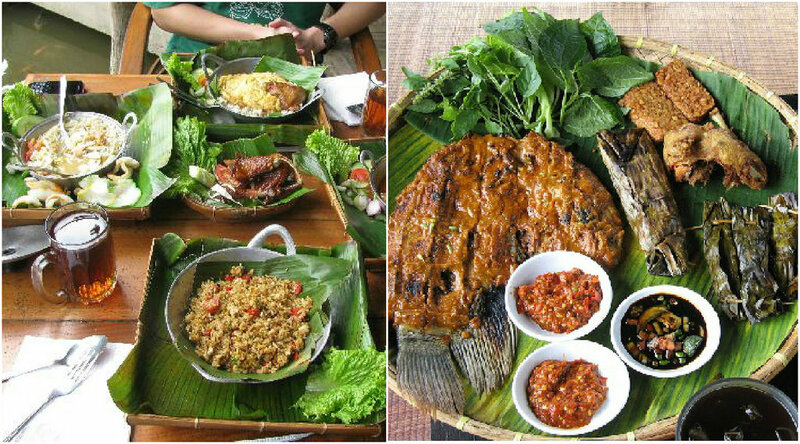 Its most famous dish is (obviously) the Nasi Liwet, which is rice cooked with coconut milk, and costs around USD $1.30. And of course, how can you miss out on trying the strawberry juice? 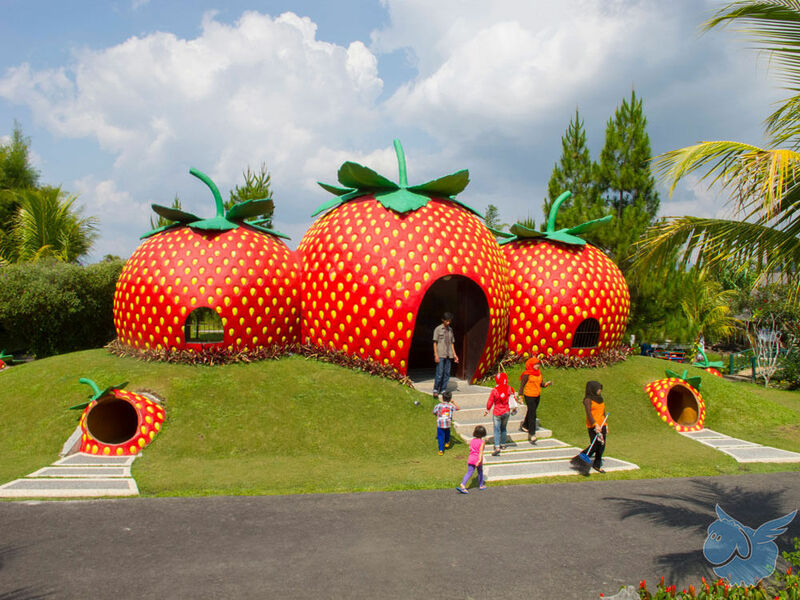 They are freshly squeezed from the fruit in its very own garden! 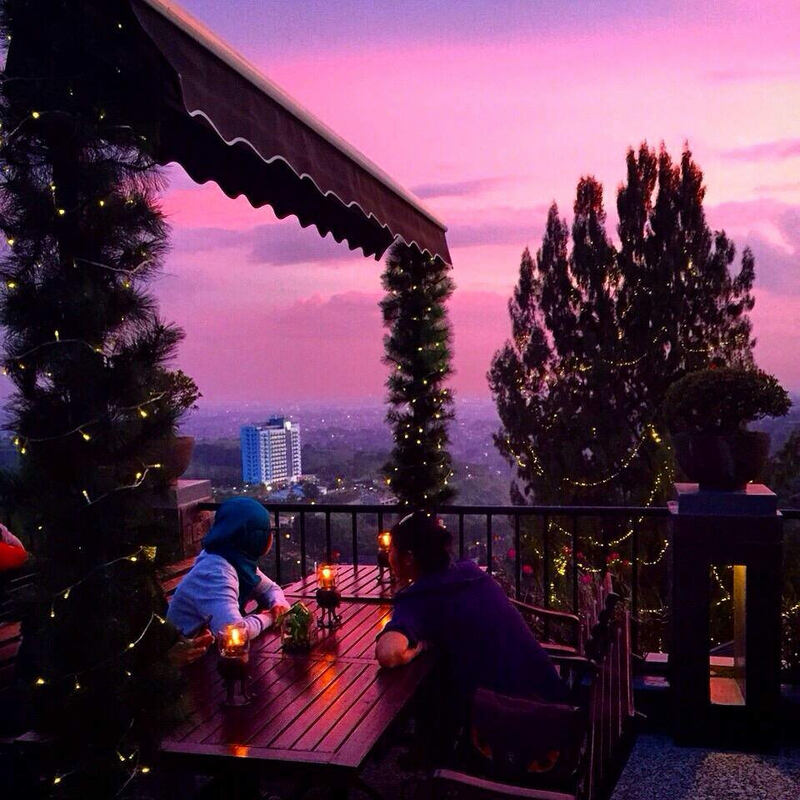 Are there any more awesome restaurants with gorgeous views we missed? Share with us and let us know! A sun-kissed wanderer who was bitten by a travel bug. She’s in love with places she’s never been to and thrives the gorgeous feeling of teetering in the unknown. Traveling leaves her speechless, then turns her into a storyteller.